Tyrannical Fears: What if Trump Is the Tyrant Gun Owners Fear? Usually it is the Left that is stereotyped as tyrannical with its political correctness and assertions of rights, according to the standard Republican line. But really, it’s Trump coming for people’s land, stampeding over rights, and ignoring public opinion. The American experiment has been a long-running concern with tyranny, resisting the depredations of King George III, fear of the installation of a new king in the form of George Washington, all the way up to the draconian policies of Hoover’s Federal Bureau of Investigation. Of course, tyranny risks real harm—just ask the denizens of Ancient Rome. But, acting to prevent a potential harm involves validating that harm through its magnitude (how big is the harm? ), timeframe (when is the harm going to happen? ), and probability (how likely is the harm to happen?). That is, it is not simply enough to state a fear (although that works astoundingly often) and act to prevent it in order to form rational policymaking. Trump’s fears of some sort of border-based crime wave do not make rational policy sense. The El Paso Times argued that Trump’s best case scenario was that the crime evidence was inconclusive. Unfortunately, we now seem to be in an era of irrational policy-making. Before Trump, building a wall as a strategy failed on all forms of what policy debaters call impact calculus (magnitude, timeframe, and probability). There are and were many reasons, of course, that the U.S.-Mexico border does not contain a wall like Trump imagines (cost, time delays associated with eminent domain seizures, probability of crime, timeframe of some sufficient amount of crime occurring attributable to the border, and sufficiently robust crime numbers or degree or level of harm). Building a wall does not make policy sense, yet Trump’s fear-mongering and tyrannical rhetoric may be having an unexplored impact—they might be increasing the number of guns owned more than the dubious fear of border-based crime. White crosses hanging from the border fence separating Tijuana, Mexico from San Diego, California. Each represents a migrant who died crossing the border. The cross in the foreground reads “No Indificado,” meaning that the deceased had no papers and could not be identified. Photo by Tomás Castelazo, via Wikimedia Commons. In this article, I make a modest intervention using the impact analysis I’ve laid out above—namely, the biggest impact is not border-based crime, but Trump’s tyranny. This is not an argument for owning guns (you don’t need them!) nor is it an argument for violence, but rather a quest to understand the inconsistencies in Trump’s violent rhetoric. First, I demonstrate how impact analysis works on border-based crime and then what impact analysis does to help us understand Trump’s tyranny. The probability of an open border leading to the destruction of the country was always low, and most people do not fear a coming invasion or rampant crime from the border. Yes, some criminals come across the border as do some drugs (and that’s true everywhere in the world), but rampant crime and drug use were not caused by the border’s porousness. Instead, they were caused by years of ineffective crime and drug policy—policies that the border wall does not solve. The timeframe for some sort of border crime wave must also be fairly long because even as the United States, Mexico, and the short-lived Republic of Texas fought over the border, nothing close to destabilization has happened, particularly as a result of crime. There is little chance that the border would destabilize United States government institutions in 10, 20, 100, or 200 years. There is some evidence to indicate that cartel activity in Northern Mexico, regardless of the completion of a wall, has a detrimental effect on the stability of the Mexican federal government and various Mexican state governments, but not that it threatens to destabilize the United States federal government. Likewise, the magnitude is low. At worst, some small fraction of drugs come across the border and the wall will not help. And rising levels of violent crime? The conservative Cato Institute indicates multiple statistical analyses show violent crime should not be a justification for the border wall. Cartoon appears courtesy of Lalo Alcaraz / Andrews McMeel Syndication. Copyright 2019. You can see more of his work at his satire website, Pocho.com. Given the lack of probability, timeframe, and magnitude, what is Trump to do? He has to become his own impact, the sum of all fears. He is, one could say, a tyrant. And tyranny has long been a justification for gun ownership, no matter how misguided. Trump might be an explanation for increased gun ownership because he poses more of a threat to life as it is in the United States than border-based crime. This problem of tyranny is deeply rooted in history, and has for some time been evident in the authoritarian president more so than an elaborate administrative state. Trump is threatening to take tens of thousands of acres of private property through eminent domain to build his border wall. Trump is rolling back protections for transgender and LGBTQ populations. Trump is rolling back prisoners’ rights. Trump is reducing or challenging protections for people with disabilities. Trump is halting help to immigrants. Trump has hurt access to the Internet. The signs are clear. Rights are in danger. But the tyrant isn’t coming. He’s here. As Andrew Sullivan has written, he is an extinction-level event (Busta Ryhmes’s album aside). Depending on who one is, and indeed, if one lives in the borderlands, one has more to fear from Trump’s land-grab and other assaults on rights than border-based crime. 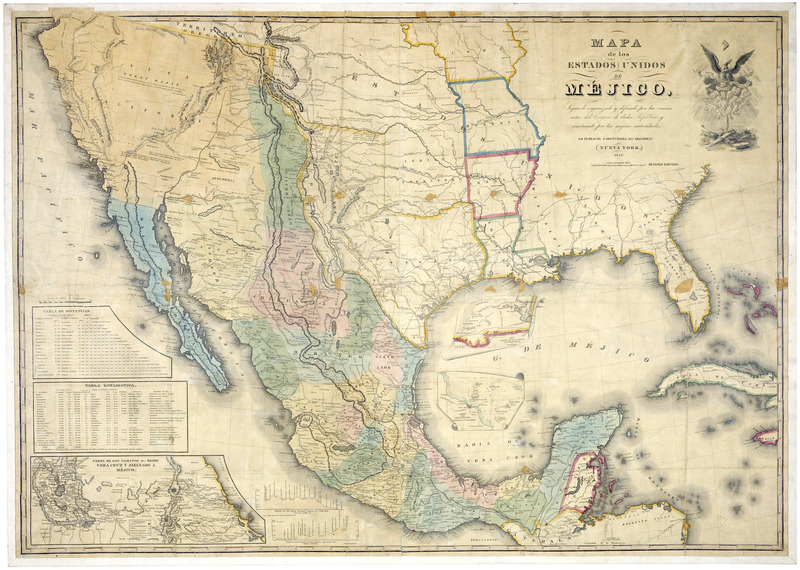 This 1847 map of Mexico, which encompasses roughly 1/3 of the present-day U.S., shows the U.S. to be, historically speaking, the threatening neighbor. Further, American theft of Mexican (and Indigenous) land would not have been prevented by a wall. Mapa de los Estados Unidos de Méjico, 1847, National Archives. Oddly, the fear of a tyrannical administrative state, a politically-correct liberal mob, or prohibitions on expressing oneself might no longer be the tyranny conservatives need to fear, but rather they ought to fear Trump-led tyranny, not to mention Trump’s arguably tyrannical reliance on executive orders to get anything done. As Trump attempts to steamroll over private property rights on the U.S.-Mexico border to build his wall, perhaps conservatives have the most to fear from Trump. In South Texas alone 6,500 acres are at risk, many of these acres privately owned. The Texas Wildlife Association, representing 10,000 people and 40,000 acres has opposed the wall. The victims are real people—families—as well as countless animal species. His tyranny, in short, seems a better justification to arms than the largely fabricated “crime coming across the border” narrative. While Trump rode the wave of draining the swamp, ridding the government of unnecessary bureaucrats and regulations (whatever that means it has not happened yet, and voters have noticed), he threatens the tyrannical action of destroying property rights and imposing increased levels of government surveillance on borderlands residents. These are ranch lands and family estates owned by conservatives and liberals alike, small family farms, and relatively open grazing land. That tyranny seems worse than the made-up fear of border-based crime, again the conservative Cato Institute argues that there is less crime along the border with Mexico than in other areas of the country. As the table put together by the Cato Institute based on FBI crime statistics shows, the border is not in the state of criminal crisis that Trump claims. Table via the Cato Institute. Although it’s easy to dismiss tyranny as an impact, something about which we must concern ourselves, as Erwin Chemerinsky (2004) argued over a decade before Trump’s election, impact analysis clearly demonstrates tyranny is happening now and the magnitude of that threat is great (particularly if one owns land, lives, or works on the border). It is a strange turn of the argument that Trump’s policies of being tough on border-based crime seem to necessitate a reinvigorated fear of tyranny far outweighing the fear of crime Trump desperately advocates. What makes this state of affairs so interesting is that usually it is the Left that is stereotyped as tyrannical with its political correctness and assertions of rights, according to the standard Republican line. It is the social justice warriors, the feminists, liberal professors, and Antifa who are threatening freedom (the plot of William Johnstone and J.A. Jonstone’s horribly written and plotted 2018 novel Trigger Warning). But really, it’s Trump coming for people’s land, stampeding over rights, and ignoring public opinion. The social justice warriors might be the least of the Right’s problems right now. In a country built on, in many ways, the fear of tyranny (when there was a legitimate fear another country would invade the United States) by people resisting governmental coercion, religious il-liberty, and lack of economic opportunity, the tyrant gun rights advocates need is in office now, and it is shockingly not Obama. This interesting change in the narrative of tyranny deserves further reflection, especially for those on the Right still holding strong to a fear of a tyrannical government. Trump’s racist fear-mongering may end up being the least of the Right’s fears as, if Trump has his way, property rights are taken and surveillance is increased. Nick J. Sciullo is an Assistant Professor of Communications at Texas A&M University—Kingsville. His work addresses race, Marxism, critical theory, and social movements. He recently published on the border wall in Monitor: Global Intelligence on Racism and has published a book on hip-hop and popular culture. Chemerinsky, E. (2004). Putting the Gun Control Debate in Social Perspective. Fordham Law Review, 73, 477-485.